Outfit of the Week: School Run Mum. 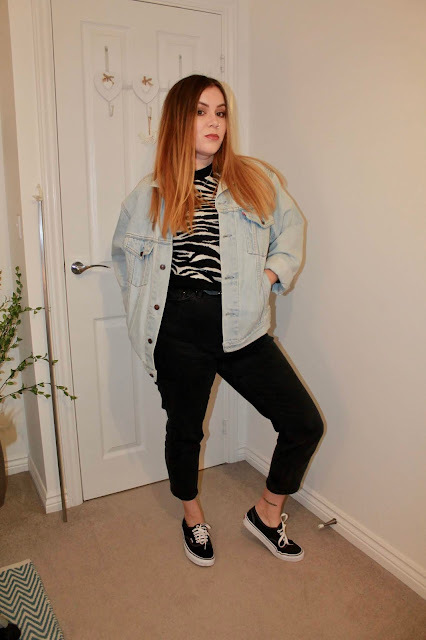 | Nicki Kinickie Nicki Kinickie: Outfit of the Week: School Run Mum. Outfit of the Week: School Run Mum. This week was pretty quiet so no exciting outfits to report for my first outfit post! Shame really because this last month I have been really busy. Had I pulled my finger out I could have got this series started a lot sooner. Saying that, as a lover of fashion I go with how I feel that day when it comes to picking out something to wear. So even if I have nowhere to go but fancy dressing a bit more glam, then I do. Most of the time on those occasions I am literally all dressed up with nowhere to go! This New Look zebra print jumper is quite new, (although it now appears to be out of stock) I bought it with a gift voucher my sister in law got me for my birthday. I am a sucker for animal print so much so there is already another zebra print jumper (with sequins!) that I have fallen in love with. I do however, feel I have quite enough animal print, knitwear and animal print knitwear so for now will hold off. I can't believe today is December 1st! It is 'Christmas Tree Day' in our house where we all wear Christmas jumpers, eat mince pies and drink hot chocolate with whipped cream and marshmallows while putting up the decs and Christmas tree. Savannah has been counting down the days! We really love Christmas Tree day in our house. Once we are done I am going to make a yummy dinner and we are going to watch The Polar Express. Tomorrow we are going to watch the local light switch on.